The Washington High School football stadium was officially named after former WHS head coach and athletic director Jim Scanlan prior to the Washington-Pacific boys basketball game. 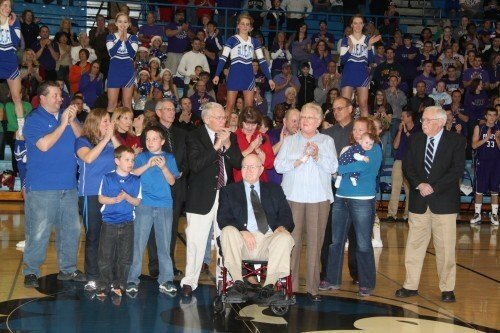 A legendary football coach received a major honor in front of a big crowd Tuesday night. The football stadium at Washington High School was officially named after former head football coach and athletic director Jim Scanlan. The official name of the complex is Rauch Field at James Scanlan Stadium. The announcement came prior to Washington’s boys basketball contest against Pacific. Scanlan was on hand to be recognized. He was joined by family members and a number of friends, former players and fellow coaches. Scanlan was Washington’s head football coach from 1965-86 and head track and field coach from 1963-74. His WHS football teams had a cumulative record of 158-49-2, capturing nine conference and three district titles. 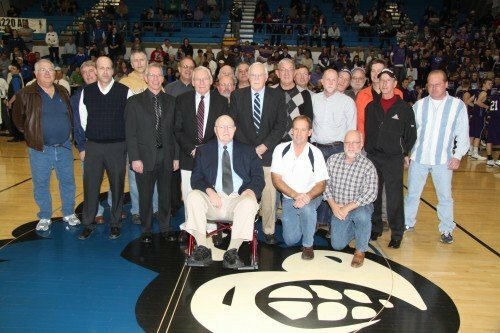 The 1973 Blue Jays team claimed the Missouri Class 3A state championship with an 11-0 record, and the 1974 and 1978 squads finished second in the state. In his 22 seasons as Washington’s head coach, the Blue Jays had just two losing seasons. Scanlan also served 21 years as Washington’s athletic director and 12 years as an assistant principal before his retirement in 1998. A 1954 graduate of McKinley High School in St. Louis, where he was a standout on the football and track and field teams, Scanlan was inducted into the Truman State University Hall of Fame in 1998. He was a lineman on the Bulldogs football team and a field event performer throwing the shot put and javelin for the track and field squad. After graduating, he was a graduate assistant at Truman while he worked on his master’s degree. Following his days at Truman, he worked for the New Cambria, Brookfield and Washington school districts. Scanlan was named the 1978 Sporting News Coach of the Year and the 1987 Missouri Athletic Director of the Year. On hand Tuesday for the festivities were current WHS football coach Zach Schneider (2009-present) along with former Blue Jay head coaches Ray Eickmeyer (1987-1990), Jim Gephardt (1991-97) and Jeff Duncan (2001-08). Also on hand were Scanlan’s longtime assistant coach John Carter along with former Union Head Coach Del Rinne and current Borgia Head Coach Dale Gildehaus. “You can see his influence by the number of former coaches and other special guests that showed up to help honor him,” Deckelman said. Duncan said Scanlan taught him many valuable coaching lessons. Jim and his wife, Bonnie (Westermeyer), have been married for 42 years. They have three daughters; Julie, Jayne and Janel, and three grandchildren; James, Harry and Madeleine. Son-in-laws Scott Brown and Brian Weindel also attended the ceremony.